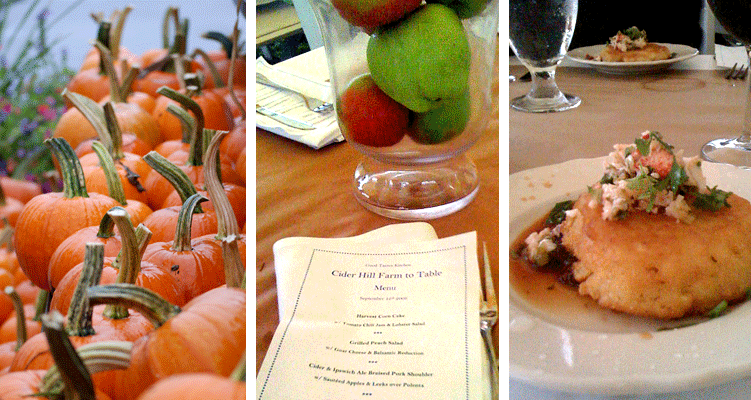 The weather did not cooperate this past weekend for the last of this year’s farm-to-table dinners, put on by Sarah Pike of Good Tastes Kitchen. But no one in the large, happy crowd seemed to mind in the least—we were cozy under the well-lit tent and enjoying the freshest, most delicious food and beverages imaginable. We began the evening with a tour conducted by the farm owners, Glenn and Karen Cook. The Cooks could not have been warmer or more forthcoming, and before the rain began, we learned some astounding facts about the 145-acre Amesbury farm, including that they grow 70 varieties of apples, 20 varieties of peaches, and often have strawberries well into September thanks to an everbearing variety grown in stacked baskets. 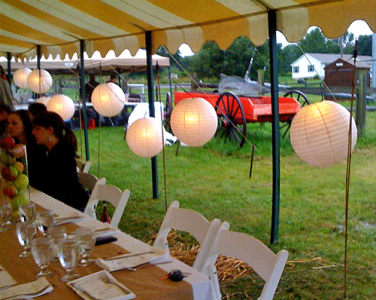 When we returned to the dinner tent, the party was in full swing thanks to local vintners Turtle Creek Winery (Lincoln) and Jewel Towne Vineyards (South Hampton, NH), along with Mercury Brewing Company. We sipped the citrusy Turtle Creek Aurora and the Jewel Towne cabernet franc while sampling cheese dip served in pumpkins and vegetable sliders. After being officially welcomed by Sarah, the meal began with a harvest corn cake topped with lobster salad and accompanied by tomato chili jam. The corn cake was dense and moist, the salad was lightly dressed, and the jam was intensely delicious. Each element was good, but when eaten together, the flavor was incredible. Next up was a salad with greens and grilled peaches from the farm, goat cheese from Valley View, and a balsamic reduction. It was a perfectly balanced combination of sweet fruit, tangy cheese, and tart vinegar. The main course was pork shoulder from Kellie Brook Farm braised in local cider and Ipswich Ale served over polenta and topped with sautéed apples, leeks, and carrots. This dish was comfort food at its finest, with the sauce from the pork soaking into the polenta to create wonderful flavor. Between courses, we heard from an American Farmland Trust representative, the beverage suppliers, and the farm owners, each giving insight into their business and expressing their pleasure at being able to participate in such a lovely event. All of the diners we talked to felt the same way, and it was a diverse crowd in terms of age and location. Many of the participants were from the Amesbury area, but we met folks from as far away as Somerville. At $80 per person with unlimited wine and ale, this meal was well worth the cost. 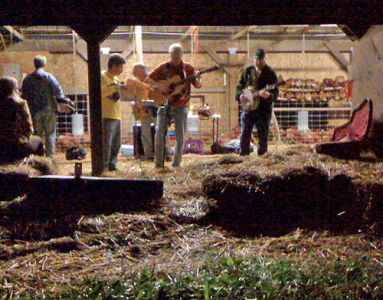 The chance to eat in this setting (a bluegrass band played in a nearby barn in front of Karen’s beloved red hens) and gain a culinary understanding of peak-season produce combined with other local ingredients was priceless. Glenn and Karen deserve many thanks for sharing their passion and making the evening possible. We hope that Sarah brings this program back next year, and we strongly encourage you to sign up for a dinner (or two) if she does.